A 19th-century mummified fetus that underwent an ancient surgical procedure while in its mother’s womb has been discovered by researchers in Italy, according to a new report. The procedure was apparently done when a mother’s life was in danger or the fetus had already died. The investigators found the mummy after a devastating magnitude-6.3 earthquake occurred in L’Aquila in central Italy on April 6, 2009. The earthquake resulted in more than 300 deaths and damaged many buildings in the nearby area, including the historical St. John the Evangelist church in the village of Casentino. The floor of the church partially collapsed, exposing underground rooms holding mummified human bodies, which included the new found fetus that dates back to 1840, according to the researchers’ estimates. A few features of the mummy suggested that an operation had taken place. The fetus’ skull had been dissected in several places and disconnected from the spine, while its arms had been separated from the rest of the body at the joints, none of which typically occurs in the process of post-mortem examinations. All of these characteristics “strongly suggest a case of embryotomy,” which was a procedure that occurred before removing the fetus from the womb, study author Ruggero D’Anastasio of University Museum at University of Chieti, Italy, told Live Science. This likely case of embryotomy “is the only anthropological proof of this surgical practice up to now in this geographical region,” he added. Embryotomy was a common practice in ancient times, D’Anastasio said. The procedure was practiced in Alexandria and then in Rome during the first and second centuries, the researchers wrote in the study. Physicians typically performed it when a mother’s life was threatened due to delivery complications or when the fetus was already thought to be dead in the womb. According to some reports, however, “embryotomy was [also] the most extreme method of abortion during the medieval period,” they wrote. The remains of this fetus had been reassembled to match its anatomic shape, including the fragments of the skull being placed at the top of the mummy inside a headgear. The careful reassembly and dressing of the fetus indicates a high sense of compassion for the death of unborn children within the local community at the time, the researchers said. The other human remains found at the site likely date back to the 19th century or earlier, as confirmed by a scientific method of age determination called radiocarbon dating and information gathered from personal objects. 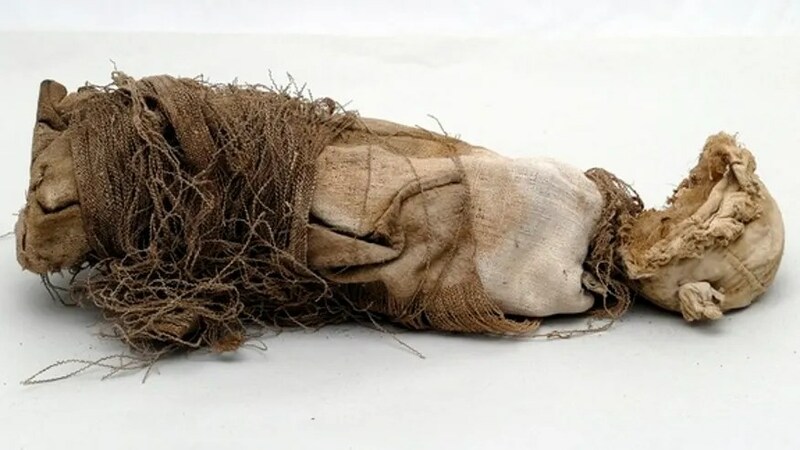 Those items include rings and rosary beads, shoes and clothes, as well as the textiles and shrouds used for wrapping the mummified bodies. Some of the bodies had lesions from autopsy procedures, such as craniotomy, in which a bone flap is removed from the skull to access the brain, according to the report published online Aug. 12 in the International Journal of Osteoarcheology.